The opioid addictions epidemic in Canada and other crises of addiction associated with substances such as methamphetamine have led to tragic loss of life and have had devastating impacts on families and communities across the country. 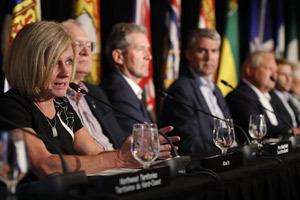 Premiers discussed the work that provinces and territories are undertaking in their own jurisdictions and stressed the value of intergovernmental cooperation in addressing this urgent and evolving issue. 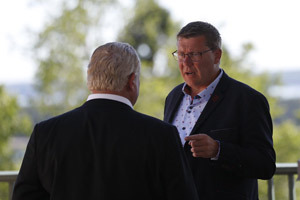 Premiers also discussed the value of provincial and territorial work with governments in the United States and around the world to address these crises with one another. Provinces and Territories will continue to collaborate on preventing and responding to opioid overdoses and deaths and other aspects of problematic substance use in a number of critical areas, including: surveillance of overdose-related deaths and opioid-related overdose monitoring; prescriber and public education; dissemination of guidelines to improve prescribing of opioid pain medications; take-home naloxone; and prevention and treatment of opioid use disorders. Premiers welcomed the funding to respond to problematic substance use and the opioid addictions emergency included in the federal government’s Budget 2018. However, as these crises continue to unfold, Premiers call on the federal government to improve long-term funding and use its levers to sustain overdose response and harm reduction efforts and support provinces and territories in meeting the needs of people with mental health, alcohol abuse and substance use challenges. 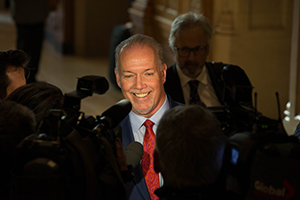 Premiers acknowledged the important linkages between inadequate or overcrowded housing and addictions and mental health issues. Provinces and territories are strongly committed to continue taking action to address this crisis and prevent further tragic deaths. Supporting and promoting healthy aging has many social and economic benefits. Benefits of healthy aging can include delaying illness for the aging population, relieving financial and capacity stress on our health care systems, and encouraging continued economical productivity. Premiers discussed the challenges faced by individuals living with chronic diseases and conditions, and the need to better support this population. Healthy aging with dignity and vitality is an important component in the management of chronic diseases and conditions. 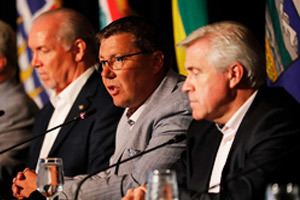 Premiers discussed best practices in improving health outcomes for seniors. Building on the success of the pCPA, Premiers committed, in July 2017, to exploring further collaboration in medical equipment procurement. 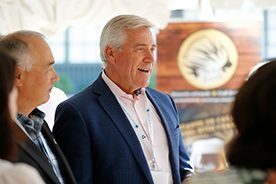 Based on this work, provinces and territories will be advancing multi-jurisdictional procurement processes for computed tomography (CT), ultrasound, home-based hemodialysis, hip/knee implants, and magnetic resonance imaging (MRI). Provinces and territories will also develop a robust process to support future common procurement efforts. Ongoing collaboration on health equipment procurement poses a unique opportunity for provinces and territories to work together to share innovative best practices, and explore strategic opportunities to realize efficiencies, achieve cost savings, and improve health care for all Canadians.